They say beauty is on the inside and semi-naked cakes are definitely a testament to that – who needs layers of fondant when layers of plain cake and icing look just as good, if not better? Not only do they look a million dollars, they’re also super simple to make, especially if you have cake geniuses like Petal & Peach guiding you through the process with some insider tips of the trade! Luckily for all us amateur bakers, Petal & Peach gave us some profesh advice on nailing the perfect naked cake. So don’t fake it ‘til you bake it, these tips will have your friends putting their orders in for your cakes in no time. As semi naked cakes only have a thin layer of protective frosting it is a good idea to bake the cake as close to the event day as possible. Plan to bake the cake on one day, decorate on the next so that the cake doesn’t become dry and crumbly – no one likes a crumby dessert. There isn’t much room to hide when it comes to semi-naked cakes. Spending extra time on making sure your pans are super well-oiled means your cake should slide right out without any cracks or gaping holes that need repairing (or re-baking). 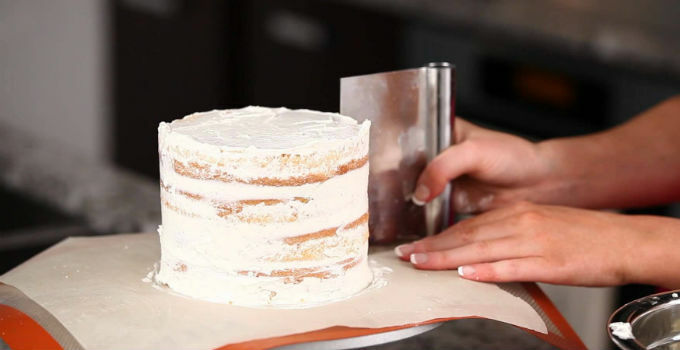 Measure your cakes as accurately as possible before cutting through to create layers. At roughly 1” deep, mark a line on your cake by lightly dragging a bread knife around the edge. Once your line is evenly marked, cut through using a gentle sawing motion. Use a minimum of three even 1” layers to achieve the right look. The important point here is to be accurate as consistent layers keep the cake stable. To help prevent the cake from drying out, make a delicious syrup for your layers. You could use a simple sugar syrup or be really adventurous and add espresso, warmed jam, or a liqueur. You only need to brush the layers with a moistened pastry brush – if you add too much the layers will become soggy. Mousse, cream, custard and cream cheese based frostings are incredibly soft, and as they come to room temperature will bulge from the layers of the cake. Choose something that has strength at room temperature like ganache, American buttercream or a meringue based buttercream. There is no right or wrong way to do this step however it’s best to start frosting the cake from the base towards the top, leaving the actual top of the cake until last. This way you can use your hand to stabilise the cake as you apply the frosting to the sides. Using a spatula (angled is easiest), generously smear the frosting on the cake, pushing it in as you go to remove air pockets. Once all of the sides are covered, grab a scraper (you can buy specialty cake scrapers from cake supplies shops or a concrete scraper – new, not used, obviously – works just as well). Run the scraper right around the cake, cleaning it each time you lose contact with the cake. Continue scraping until you have a light covering of frosting sitting on the surface of the cake and a smooth finish. Frost the top, pushing the frosting over the edges and then once smooth and even run your scraper around the exterior edge of the cake to collect the overhanging frosting from the top. Once your cake is assembled and frosted, you can decorate it however your heart desires. Some of Peach & Petal’s personal favourites include edible flowers, dripping caramel sauce, ganache, fresh fruit, roasted nuts, macarons, chocolates and acrylic toppers. Once your cake is assembled it is important to put it in the refrigerator to set. This stabilises the cake and makes it easier to transport. Always let your cake come to room temperature before eating – it tastes so much better! And if all that sounds like to much effort, even for you, you can always just order one of Petal & Peach’s epic creations!